A blind World War Two veteran who fought a High Court battle to leave his care facility has told a judge he is "living again" after returning home. Douglas Meyers, 98, had been refused permission to return to his bungalow home of 40 years, where he wanted to finish his life. After a hearing earlier this year, Mr Justice Hayden decided he could return to his home near Southend, Essex. Mr Meyers told the judge he was enjoying being back. The judge, who analysed evidence at a trial in the Family Division of the High Court in Southend, said the "ideal solution" would be for Mr Meyers to return home with a "suitable package of support". Speaking via a telephone link after he returned home last week, the former Royal Navy gunner told the judge: "I have had eight days of living again." Mr Justice Hayden told Mr Meyers, who served in the Italian and north African theatres during the 1940s, he had to be pleasant to social workers and carers visiting his home. He told him to smile at helpers "until your teeth hurt". 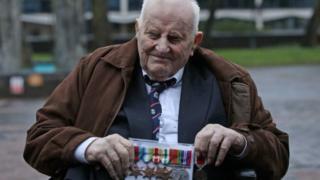 Social services bosses at Southend-on-Sea Borough Council have welfare responsibility for Mr Meyers and had asked the judge to make a decision about what was in the veteran's best interests.